Do you remember that feeling you got as a youngster when you did something all by yourself? And now as a parent seeing the unmistakable pride that your child exhibits when they achieve something completely on their own? It’s pretty awesome. And it seems that no matter what your background, gender or culture, LEGO gives kids an amazing platform to create, to foster their young imaginations and ultimately to feel proud of what they are able to build. 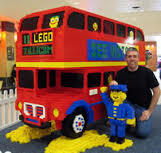 We had the opportunity to speak with Canada’s only LEGO Certified Professional (LCP), BC’s very own Robin Sather, to find out more about LEGO, the new program recently launched called “City of Tomorrow” and to find out how he managed to land every kid’s dream gig. UB&T: Hello Robin! First up, can you tell us first how you scored the best big kid gig ever in becoming a LEGO Certified Professional? RS: I actually helped LEGO set up the "LEGO Certified Professional" (LCP) program in 2005. Essentially, talented entrepreneur builders can apply to the company to become a licensed LCP. There is a program which includes training, and a certification process, after which LCPs are sent out to do LEGO-based events, live builds, commissions, custom kits, and more. I was one of the first four, and am still the only Canadian LCP. UB&T: Can you tell us a bit more about LEGO City of Tomorrow and why you are so excited about it? RS: The City of Tomorrow campaign is underway right now and aims to inspire young Canadian builders to use their imaginations and build their own vision for future Canadian cities with LEGO. And the timing couldn’t be more perfect with Canada’s 150 fast approaching, giving us the perfect opportunity to think about the past and inspire the next generation to think ahead to what will make Canadian cities better, brighter and even more fun! UB&T: How can young Canadians get involved? RS: It’s easy! First they create their own LEGO City of Tomorrow build expressing their vision for the future. Then they capture and submit online at www.legoplay.ca/city-of-tomorrow from now until June 4. They can also share on social media using #LEGOCityofTomorrow and on Facebook and Instagram using @LEGO or on Twitter using @LEGO_group. UB&T: We hear one lucky family will win a trip for 4 to Ottawa to celebrate Canada’s 150! That’s awesome. RS: It is awesome. Parents can enter a photo or video of their children’s builds to www.legoplay.ca/city-of-tomorrow and one lucky family will win a trip for 4 to Ottawa to celebrate Canada’s 150. You can even enter multiple times for multiple creations. UB&T: And what kinds of exciting builds have you seen young builders create so far? RS: It's been interesting to see how some kids focus on technology, and futuristic gadgets, while others look to nature, ecology, and green spaces, and still others focus on what people will be working and playing at in their City of Tomorrow. In my work as a LEGO Certified Professional, I get to see hundreds of kids build cool stuff, and I'm constantly amazed at what they come up with. UB&T: Any professional tips and tricks you can share with young builders looking to create an awesome City of Tomorrow build? RS: I usually tell kids to learn patience. Everyone always wants to create something amazing right out of the gate, on their first try! In truth, almost no one builds like that. Most builders, myself included, have to build, and rebuild - refining parts of a model each time, and gradually creating a build that they are happy with. With each change, you often learn something that you can incorporate future builds as well. It's like writing. Very few writers put pen to paper, and produce a final, finished story on their first draft. It takes many versions, and much editing, to come up with a great story. That one tip will enable a young builder to go from a good builder, to a great builder. UB&T: Any other amazing LEGO action that you are excited to share with us? RS: Well, I am most excited about the LEGO House - due to open this September in Billund, Denmark, the home of LEGO. It's going to be the ultimate LEGO museum, and interactive experience. I have the privilege of being invited to the grand opening, and I can't wait.